If you’re contemplating a trip to or through Louisiana with kids, your thoughts may run first to a certain big city in its southeast. Yet up in the northwest corner of state, built on the banks of the river Red, you’ll find a very different city steeped in Louisiana culture both high and homespun, where music legends of the past and present have strummed and sung their way into the hall of fame, and generations-old family restaurants continue serving their signature gumbos and crawfish etouffee. Shreveport, you’ll quickly discover, has plenty to offer visitors. Especially those visiting with kids. If you have the opportunity to visit Shreveport, here are my top 4 recommended activities for families, along with recommendations for 1 great place to stay and 1 great place to eat while you are there. Entering into the Space Sciences Gallery of Sci-Port, with 60+ exhibits of its own. The average family with school-age children might spend an entire afternoon exploring Sci-Port, where you can practice a simulated space shuttle landing in the Space Sciences Gallery, practice the art of launching paper airplanes at various angles and speeds in the Physical Sciences Gallery, and explore a mini replica of Captain Shreve’s riverboat surrounded by exhibits (amphibious, archaeological, and other) celebrating the exploration of the local river in the Red River Gallery. Once you’ve worked your way through the main galleries, don’t miss a show in the Space Planetarium, and be sure to check what’s playing in the IMAX theater (movie tickets sold separately or at a discount with Sci-Port admission). Sci-Port is open 7 days a week, though hours vary by season. For current hours, admission fees, and special exhibits, visit Sci-Port online at www.sciport.org. Gators & Friends is home to an alphabetic ensemble of animals ranging from alligators to zebras, but while it may sound like a preschooler’s paradise, thrill-seeking teens and adults should take note of the zip lines passing over head. While small children enjoy rides on miniature horses and visits with camels, capybara, and their cousins; the more adventurous harness up here to fly through trees and pass over alligator ponds–sometimes upside-down. You can read more about ziplining with Gators & Friends in my personal account here. Bring your camera for a free photo op with a baby alligator and spare change for snacks to feed the animals. Gators & Friends is located 10 miles west of downtown Shreveport just off Interstate 20, and it’s open most days of the year. For current hours and additional information, visit www.gatorsandfriends.com. 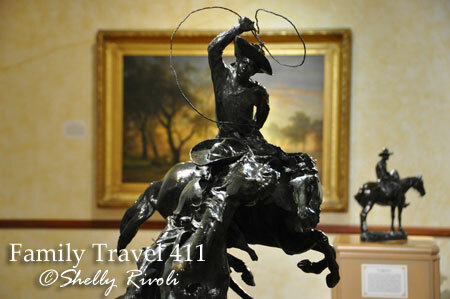 One of many bronze sculptures by Frederic Remington housed at the R.W. Norton Art Gallery. Renowned sculptor Frederic Remington’s riders rear up in bronze against a backdrop of historic paintings of the American west as visitors enter the R.W. Norton Art Gallery. Among the Norton’s impressive collections of original European and American art, you’ll also find centuries old tapestries, art glass, and silver. But the R.W. Norton Art Gallery also houses exhibits with special appeal for the young. Don’t miss the whimsical gallery featuring bronze sculpture of storybook characters (lead photo above) or the antique porcelain doll exhibit, where Louisiana fashions from 1720 to 1920 are preserved in miniature and in intricate detail. Admission to the museum and its special exhibits is always free. More information at the Norton’s official website: www.rwnaf.org. Kid-friendly fountains refresh at the Shreveport Riverfront. When you’ve had your fill of artistic masterpieces, zebras and zip lines, and scientific wonder, relax at the Shreveport Riverfront Park. Not only are the fountains lovely to watch and the views of the river to be rivaled, but kids (and caregivers) can get sprayed to their hearts’ content in this set of splash-park style fountains on the upper terrace. The riverfront fountains are conveniently located across the street from Sci-Port, so plan your schedule accordingly. Hot breakfast daily, complimentary grocery shopping, and dinners Monday through Thursday? An easy choice for many families. To the west of downtown Shreveport off I-20 (en route to Gators & Friends), you’ll find the Homewood Suites by Hilton Shreveport, where every suite has a fully equipped kitchen and at least one flat-screen TV. Whether staying in a studio, one-, or two-bedroom suite, your family can enjoy a complimentary hot breakfast each day and dinners Monday through Thursdays. For more information and current specials, click here to visit the Homewood Suites Shreveport official site. The third generation of Herby K’s carries the torch on a busy night. Herby K’s kicked off in 1936 and, with a menu featuring 15 cent sandwiches, it quickly became popular among the hungry workers coming and going from the nearby rail yards. Though times and prices have changed a great deal, Herby K’s remains a lively favorite among locals and was named a “Best of the South” Editor’s Pick for Best Seafood by Southern Living magazine. With patio ambiance and picnic table splendor, it’s a place where grownups can relax and enjoy signature Shreveport fare while choosy kids can choose what they like from the children’s menu. Not to be missed: the original Shrimp Busters, which Herby himself made famous some 75 years ago. For the current menu and directions to Herby K’s, visit www.herbyks.net. For more recommendations, event information, and general help planning your visit to Shreveport, visit www.shreveport-bossier.org. You visit the best places. Thanks for sharing so much detail. What fun! i would NOT touch that croc. yikes!